Just Do It! Iteration Makes Perfect! : Solving Systems by graphing? 360 Degree Math is the Best! Solving Systems by graphing? 360 Degree Math is the Best! This year is a very exciting year for me. I have six Algebra 1B classes and one Algebra 2 class. Algebra 1B consists of sophomores and upperclassmen who need to complete second semester of Algebra 1 throughout the whole year. Not too many teachers receive the gift of coaching the students who don't "play school" very well. To make sure I use this opportunity wisely, I made a list of things I need to follow at all times. Model for less than 5 minutes. ALL work done while in classroom. Make videos and work available online for frequently absent/sick students or for ones who want to review at home. 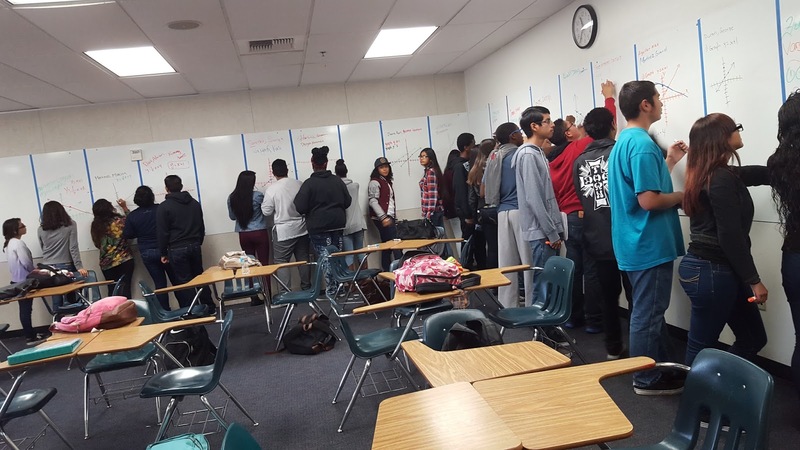 My students love writing on the boards. Since the majority of my students don't keep notes or work at home, I wanted to increase the frequency of 360 degree math usage in my room. I have students work in groups of 2. I like having two students work together because throwing ideas at each other makes working on tasks so much more fun. I have each student pick a different color marker. They have to write their names up on top of the board above their head. Last name comes first, then the first name. Since I can only see the backs of my students, I can't tell which ones are doing well and which ones need assistance. So the name on the board is a crucial piece. I stand in the middle of the room. I use my projector and my bamboo tablet to show how to graph a basic linear equation. This takes less than 2 minutes. Then I give them another equation. I tell them, "partner 1 in the group, please graph this equation. You may consult your partner." I write the new equation on my computer that is projected. They get loud and things go on their boards. I identify struggling groups and approach them to assist them. I try my best to go around the whole class and tell them "great job!" if it's done correctly. Then I give them a new equation and have partner 2 graph it. Afterwards, I tell them that I'm giving them a challenge. "Let's see who really got this. Partner 1 or 2." They get excited. I tell one person in the group to graph the first equation. Then I tell them not to erase the graph. On the same board, I tell the second partner to graph the second equation. They feel confused. Some ask, "Are you sure we don't erase the first graph?" but follow through. I tell them, "I want to tell you the truth. I know both partners got it and it's okay if you worked together for both graphs. This wasn't a competition. I just wanted to teach you my lesson for today. We learned how to graph a system of equations!" Then I ask them where they think the answer would be. They look at their board. Some kids remember what the answer is from their previous years in Algebra 1. Pretty soon the whole class picks up the answer from that one child since all students can see each other's answers. I teach them how to write their answer in coordinate form. If we tell our students to take notes in their notebooks on their desk, some students will have their eyes on their desk and their pencil will be moving, but when you get to their desk, all you see is doodles. Some students are just brave and they do nothing. Similar things happen with 360 degree math. 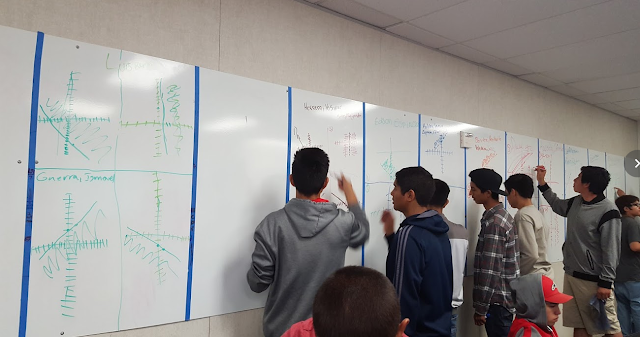 Some students refuse to get out of their desk and stand next to the board. They don't want to do anything. Some students write their name on the board, but start doodling. Great thing here is that I get to see that immediately and I get them back on task or call their parents. 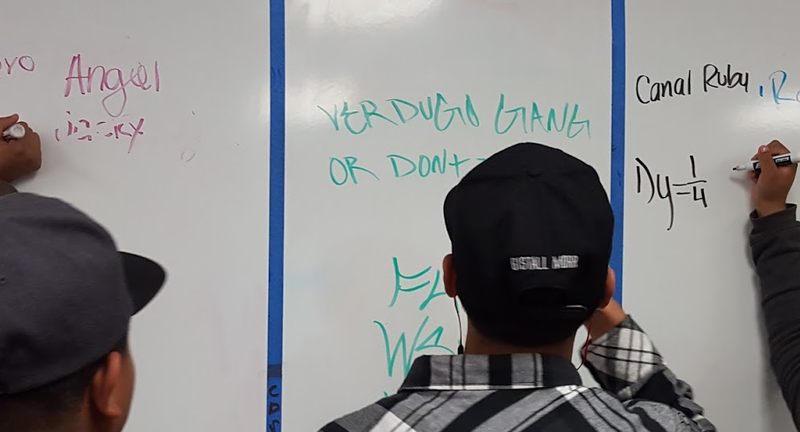 Some students write their names on the board, then stand leaning on the board. They do it very strategically in cramped areas. So it takes me a while to identify those. But I have chosen to work with the 33 students who are working on the board actively rather than the three students who are not. I still talk to them about it after class. 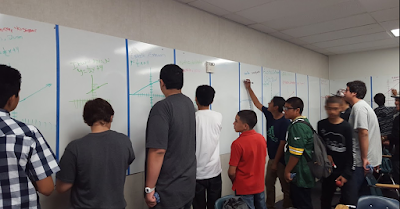 Some students are scared of being wrong, so they wait until that one child gets their graph done, then copies it. I'm okay with that. I just try to remember who that child is, then I talk to them about being confident and about having fun when you are wrong. This is a great way to identify the students who really get it. When these students get the same question wrong on a test, I pull them out and ask them why they got it wrong. Usually they tell me tests scare them. I give them credit for the question if they can show me how to solve it right then and there as we are having our conversation. 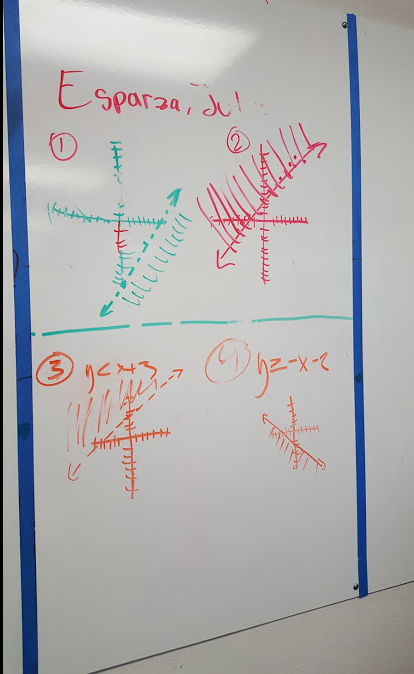 To summarize, 360 degree math is a great tool for any math lesson, but I wanted to show you an example on how I used it in my class for solving systems using graphing. 360 math is great for formative assessment, error analysis, creating a social environment, lessening math anxiety and promoting group work. I hope this answers your question on how I might be utilizing the boards all around my room. Please tweet me up at @MathPrincessC if you have any questions that I didn't address in this blog. And finally, I wanted to thank a few people in the district who helped me purchase and install boards all around my room. You know who you are. Many thanks for supporting my work and believing in me. Thank you. I did send you an email and look forward to your response.